For a company that’s already global number one in unit shipments of injection molding machines, it comes as no surprise that China’s Haitian Group (Ningbo) wants one day to be number one in the all-electric machinery sector. Spearheading this effort is group company Zhafir Plastics Machinery with production plants in Ebermannsdorf, Germany and Ningbo. Haitian’s all-electric machine shipments rose by 14.2% to approximately 800 units in its last fiscal year despite an approximately 20% fall-off in overall machine shipments due to the global downturn and a credit crackdown in China. “This year looks even better [for electric machines] and if we meet our 2013 target of more than 1000 machines, we may enter the top five,” says Professor Helmar Franz, Haitian’s CEO. “Being in the top five is an important step but in the long term, we don’t want to be number two,” says Franz, hinting at the eventual target of global number one in all-electric machines. The company’s new 200,000 square meter plant in Ningbo will be used for production of both all-electric and hydraulic machines but eventually, Franz sees it transforming into a factory dedicated to the production of all-electrics, thus functioning as a cornerstone in its ambitions to be top global electric machine builder. At Chinaplas, Zhafir launched its new all-electric Venus II Series with four additional clamping sizes (3000 kN, 3,600 kN, 4500 kN and 5500 kN). 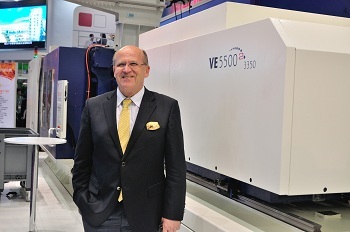 The smallest machine in the series has a clamping force of 600 kN while the 5500 kN press is the largest ever. “We don’t plan on going bigger yet because the cost equation [for electric machines] does not work out for machines larger than 5500 kN,” says Franz. The optimized clamp for the new electric models provides larger tie bar space and therefore more opportunities to use larger molds. An optimized injection unit, meanwhile, delivers 20% better acceleration. More dynamic and shorter dry cycle times can also reportedly be achieved with the improved kinematics of the toggle system. A much more compact machine design, meanwhile, is said to offer a lot of space for power packs and auxiliaries. Further, the swiveling injection unit and ejector rapid release coupling provide easier accessibility and easier maintenance. In addition, the auto centralized lubrication system is reportedly optimized to improve the efficiency and dramatically reduce costs. Overall Haitian manufactured around 22,000 machines in 2012 versus a peak of around 30,000 in 2010 and 27,000 in 2011. “Demand was off but another reason behind lower shipments is that our machines are getting more efficient and productive,” says Franz.